There is a blank notebook, unique and vintage style, for your free write and record, such as diary, planner, sketch, etc. 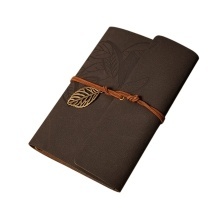 Loose-leaf notebook with leaf pendant. Blank inner pages for your free write. Unique and vintage style with leather. Can record your diary, travel journal and note. A very beautiful gift for yourself or your friends.